It's here, it's FINALLY here. I've been waiting for it to launch in Pakistan from SO long. Now, I can't wait to dip dye my hair Ombré and see whether it is handy to dye Ombré at home. 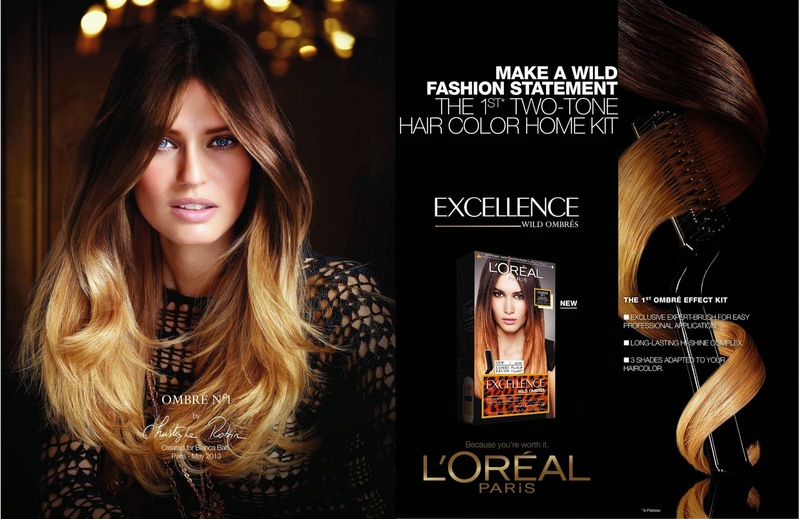 the 1st ever revolutionary range of dip-dye hair color kits to the Pakistani market, Wild Ombré. The new kit helps achieve the Ombré hair look, which consists of dual colored hair with dark roots and light ends, and is fashion’s “IT” phenomenal this season. The Ombré trend has become the latest must-have accessory for an ultra high-fashion look, directly inspired by the world’s brightest stars. L’Oréal Paris makes the Wild Ombré look super easy to achieve: With a specially designed brush applicator, the hair color is easy to apply and adapts to 3 distinct base shades: No. 1 for Light Brown to Dark Brown hair, No.2 for Dark Blonde to Medium Brown hair and No.3 for Blonde to Dark Blonde hair. The new hair color kit is available for PKR 1,200 at all leading retailers nationwide. Have u tried it Rabiyah ? How was the result ? Wanna know ur experience.